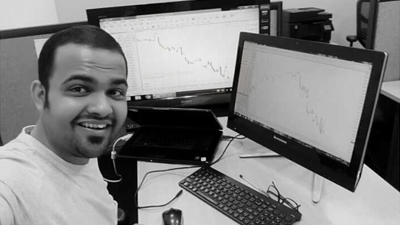 Last week, we got a chance to interview Mr. Harshubh Shah, a full time Nifty trader and technical strategist. His story is really unique and motivational for anyone associated with Financial markets. He has loads of experience in Indian stock market and runs his own youtube channel to guide newbie investors. He has earned more than 80 times return on his initial capital which is definitely worth applaud. Mr. Harshubh is an engineering dropout which makes his Trading success story even more interesting. Please read through and let us know in comments section if you have any specific questions for him. Hello, I am Harshubh Shah. A full time Nifty trader and technical strategist. Ofcourse! As I belonged to lower middle class family , I lost my dad’s 5000 INR in the first trade and that loss shattered me deeply. After a while I again traded with 2000 INR and lost that too. I got restless and panicked , I locked myself at home for more than a year and searched internet and read whatever I could to know more and more. I was hungry for success and somewhat scared too. Never give up ! It was 2008, after 2 years of experience I started making money slowly and my neighbors started showing interest in me because of my accurate suggestions. I used to do intraday back then. I started with 5000 INR and due to 10X intraday limit I started trading and multiplied my investment by 80 times between 2008-2010. Now after so many years , I trade only positional using my Algorithmic Trading system which I designed using my 1 year of engineering experience. As they say , whatever happens, happens for own good 🙂 Now I run My Own Youtube Channel to help newbie Traders. Its not easy to make career in stock market in India as people/society thinks you are a gambler. I hope things will change with this initiative of mine . Technical. I don’t believe in fundamental at all. Many.. I select basically using Supply and demand and then refine more using past experience and strategies. 80 Times & Counting ! Always use Triple Margin to Trade any stock. For example: If margin is 50k, then always keep 1.5 lakhs in your account to trade that stock and use proper Risk Reward Strategy. Sandip Maheshwari . I owe everything to this man! Motivational speaker. For more information, just Google him ! Thanks Harshubh for sharing your wonderful Trading success story. It is really a honor publishing your interview here. Also, thanks for your awesome feedback on Trading Tuitions. Please feel free to ask him your ‘specific’ questions in comments. But do not expect that he will spoon feed his trading strategy. We apologize that we cannot provide ‘takeaway’ from all our articles. Nothing is in this article . But hear is a YouTube channel name Impulse techinical . Channel owner – Hurshube thire you must learn every think . Hi Harshubh nice to meet you.Realy I’m impressed . You are educating people , really doing a great job. Hakinasy Candle Software in Bank Nifty Strategy, 3 high and 3 low candle buy or sell trategy. Can you please the name and address of the Astrologer? I am also dropout and wants to know the destiny of my life. Please tell me.